Artist's concept of NASA's James Webb Space Telescope, which is scheduled to launch in 2018. Few researchers could have predicted the diversity of the Hubble Space Telescope's workload when the iconic observatory launched into orbit a quarter-century ago this week. For example, Hubble helps scientists search for exoplanets, which were first discovered two years after the famous telescope's April 24, 1990, launch. Hubble also charts the universe's accelerating expansion, a surprise discovery the instrument helped make in 1998. "We knew it would be around for quite a while, but I don't know anyone [who] predicted a 25-year life or 30-year life," said Marc Postman, an astronomer at the Space Telescope Science Institute in Baltimore, which manages Hubble's science operations. What's next for space telescopes, from a tech perspective? Postman said that, ideally, all such scopes would be serviceable, although the ones planned for the near future won't be. But the big observatories expected to reach space in the near future will carry a legacy from Hubble's quarter-century (and counting) of successful operations, he added. Hubble observes the cosmos from low-Earth orbit, just 353 miles (569 kilometers) above the planet's surface. The instrument's immediate successor, NASA's $8.8 billion James Webb Space Telescope (JWST), will launch in 2018 to the Earth-sun Lagrange point 2, a gravitationally stable spot about 930,000 miles (1.5 million km) from Earth. With each generation of telescope instruments, the technology gets better and better. A typical cellphone's camera's imagery is better than what Hubble could manage upon launch 25 years ago, McCarthy said. 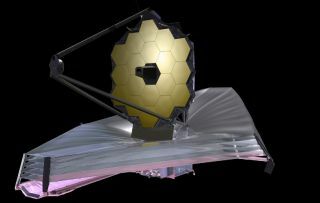 "New space-based telescopes are using lightweight mirror technologies — such as the … machined-beryllium mirrors on the Webb Space Telescope — to reduce launch costs and thermal effects," he told Space.com via email. Additionally, Webb's design is foldable, which Hubble's was not. Because the James Webb Telescope can see more in the infrared than Hubble can, the two telescopes will be able to make complementary observations of objects to get a more complete view of what is happening in the objects' interiors, Postman said. Additionally, the James Webb telescope's larger primary mirror — 21.3 feet (6.4 meters) wide compared to 7.9 feet (2.4 m) wide for Hubble — will allow the newer telescope to study galaxies that formed even closer to the Big Bang, the event that created the universe 13.82 billion years. Hubble's discoveries of galaxies that existed just 500 million years after the Big Bang was a surprise, Postman said, and informed the design of the James Webb telescope in that regard. NASA has two telescopes in storage, donated by the U.S. National Reconnaissance Office (NRO) in 2012, which could be used for a mission called WFIRST-AFTA (Wide-Field Infrared Survey Telescope-Astrophysics Focused Telescope Assets). Artist's concept of NASA's proposed WFIRST-AFTA space-telescope mission, which would use gear donated to NASA by the U.S. National Reconnaissance Office. Should WFIRST-AFTA be approved, it could launch as early as 2024. One telescope would go into space, and the other would stay on Earth as an engineering test bed. The NRO telescopes have the same mirror diameter as Hubble but a field of view that is 200 times larger. This will allow astronomers to map out processes such as star formation or galactic activities across a much larger extent, Postman said. "One of the key things we learned with Hubble is that the high angular resolution Hubble provided allowed us to understand an incredible amount about objects in the cosmos, processes in star clusters and galaxies that were not seen before," he said. McCarthy pointed out that no telescope works in isolation, and Hubble was a prime example of how collaborations can work across different telescopes. Such cooperation helped nail down the expansion rate of the universe, among other things. This is a legacy McCarthy said he will be glad to carry on with the Giant Magellan Telescope (GMT), which he directs. The ground-based observatory in Chile will combine several mirrors to get a single, equivalent collecting surface of 80 feet (24.5 m). "By the time GMT sees first light in 2021-2022, we hope the JWST will have been operating for a few years," McCarthy said. "The scientific synergies produced by the combination of the JWST and telescopes like the GMT will be for the benefit of astronomers around the globe." NASA is also working on potential telescopes with more experimental technologies, such as the "Orbiting Rainbows" concept, which would use millions of tiny particles, rather than a conventional mirror, to reflect light. This strategy could be used to search for exoplanets, researchers say, because it is advantageous to look for alien worlds in the infrared — longer-wavelenght light that is more easily refracted by the particles than is optical light. Orbiting Rainbows is an example of telescopes that don't necessarily have to be big and heavy to perform valuable science, said principal investigator Marco Quadrelli, of NASA's Jet Propulsion Laboratory in Pasadena, California. "The problem with telescopes like Hubble and JWST is they are monolithic. They are heavy, and they are big," he told Space.com. "We are trying to go even further out in the future and use telescopes that are ultra-lightweight and very small."